Anyway, this is what I have made the last couple years, picked up a kit from a place in the US owned by the authors of Clone Brewing. Their instructions were well detailed that I could just buy the ingredients again to make it again. I want to change it up a little bit this year, and add a smokey character to it, nothing in your face, smoke bomb, but just a nice subtle smokey note to it. Any suggestions as to what to use? Add to the recipe? Or replace something? I will be swapping out the LME for DME, as I am not getting the color on the brews I am looking for. Mostly from the factor of the act of boiling the LME actually darkens it. Just did a Pilsner Urquell clone, and it is anything but looking like a pilsner because the LME darkened so much. Of course for anything DME that isn't light or dark DME, I have to go to mail order as NG doesn't carry anything else but the light and dark. I can at least get Pilsen DME from a couple of mail order places. I believe that any form of extract, liquid or dry, is going to produce a darker beer. Agreed, one of the things I hated about extract brewing. DME doesn't. Something about the moisture content left in the malt. Because there is more moisture in LME, it can darken over storage time as well as time in the boil. DME has less moisture, therefore is not as susceptible to the darkening. Makes sense, I did a pils last year with all DME and it came out looking like a pils. The one I just did with LME, is much darker, although just having a sample of it now, it isn't as dark in the glass as it looks in the fermentor. 2 packs of Wyeast Czech Pils on a started, 2 weeks at 16C, and not even close to the FG is should be. Tastes OK, no buttery flavor, but is sweet. 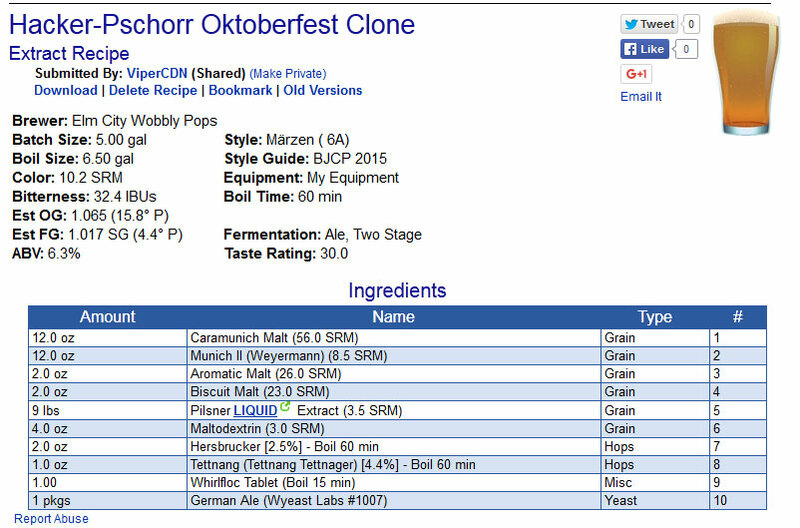 Anyway, any ideas on adding a subtle smoke content to the Oktoberfest recipe above? You could reserve half the extract for the last 10 minutes of the boil. Or you could sub some extract for corn sugar / dextrose. Either of those options would give you a lighter color beer. I don't have much experience trying to add smoke flavor to beer. But I did use peated malt in a Wee Heavy once with good results. I'm pretty sure that liquid extract is dark because its already been through a round of processing and has already been heated/boiled once before. Even doing 15-20 minutes longer on your boil will make it darker. So...since no one has answered, going to bump this to see what I can do to add a smokey element to this brew. I don't want an in your face smoke, just a subtle character. You know it's there, but not overpowering. Smoked malts I can get: Beech Smoked, Oak Smoked, Peated, and Cherrywood Smoked. The last one sounds interesting, just not sure if the cherry will get lost with the other malts. So, how much should I use? Should I replace anything already in the recipe? Or just add to it? I use 5oz of peat smoked malt in a Porter and noticed a just right amount of smokiness for me. I'm on a 5 gal system. I know that some folks on here have used more, but I wouldn't use much more. Beech smoked malt is a bit different. You would use more to notice the same amount flavor as above. @jamie_savoie has used it. They are all a bit different in terms of strength. Sorry that I'm late to answer, I usually put 1.25 lbs of cherrysmoke in my 10 gal scottish. I know it's a cheat but it give a little bit of smoke flavor on the after taste. I've tried it with extract also with good results. Beer temperature also make a big difference. So if you want the smoke to taste a little more let your beer warm up a little bit.